Crystal structures of La2-x-ySrx+yLiH1-x+yO3-y (x = 0, y = 0, 1, 2). 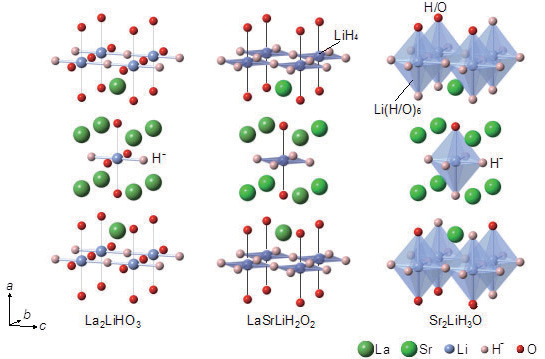 The coordination environment around lithium ions continuously changes with a change in the O/H– ratio. The four axial sites of the Li-anion octahedra (anion sites in Li-anion planes perpendicular s-axis) prefer to be occupied by H–.